There are four primary factors that affect plant growth: light, water, temperature and nutrients. These four elements affect the plant's growth hormones, making the plant grow more quickly or more slowly. Changing any of the four can cause the plant stress which stunts or changes growth, or improves growth. It's important to learn as much as you can about each of the four factors and your own plant or garden's unique needs to maximize plant growth factors for a lush, healthy garden. Light, water, temperature and available nutrients are the four things that affect plant growth the most. You may wonder where soil fits in this discussion. Plants can grow without soil using a gardening method called hydroponics, but they cannot grow without nutrients. Plants evolved over eons in very different locations around the world. They may have developed in tropical locations under the canopies of great rain forest trees or on the slopes of a harsh mountain range in China. Because of this, plants are adapted to different types of light, and some cannot adapt easily to new conditions. You must understand the type of light your plants require and provide it for them. Light also varies in intensity from season to season. During the winter months, the days are shorter and the light less intense. As the spring equinox approaches, the amount of light available to plants and the intensity increases. Light and temperature changes in the spring stimulate plants to break their dormancy and grow new leaves. Sunlight during the summer encourages flowering and fruiting, which in turn creates the beautiful display of flowers or delicious vegetables from the garden. Later, as the light changes in the fall, many plants react by shedding their leaves. Plants need water to survive. People are made up of approximately 70 percent water, but plants are closer to 90 percent water, and without water, plants become stressed and die. Even the desert cactus requires water, albeit much less water than other plants. Water nourishes the plant and hydrates it. Water in the soil breaks down and dissolves minerals and critical elements in the soil. As the plant absorbs water through its roots, it also transport nutrients into its cells. Water and humidity in the air can encourage plant growth, but too much water can kill plants. 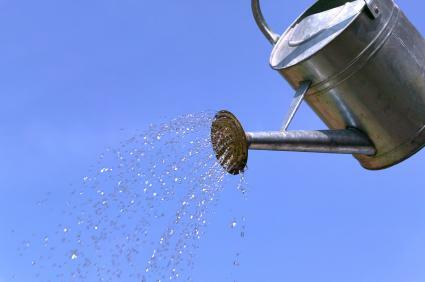 It's important to provide your plants with the right amount of water for their needs. Plants react to temperature by speeding up or slowing down all of their life processes. Warmth encourages germination and growth. Warmer temperatures actually trigger chemical reactions inside the plant's cells, which speed up transpiration, respiration, and photosynthesis. Plants grow more quickly during warm periods and slow down or even become dormant during cool or colder periods. Plants require certain basic nutrients for growth and maintenance. There are 17 nutrients which plants need to survive. Three of these nutrients are taken from the air and from water: hydrogen, oxygen and carbon. They must be able to find the remaining 14 nutrients in the soil. If any one nutrient is lacking, it can slow plant growth or cause stunted growth. Soil nutrients are divided into two categories, macronutrients and micronutrients. Plants need more of the macronutrients than micronutrients. Macronutrients include nitrogen, potassium, calcium, magnesium, sulfur and phosphorus. Micronutrients include iron, copper, and many other elements. One problem gardeners often face is an imbalance among the soil nutrients. The macro and micronutrients listed above must all be available to the plant since some help the plant absorb others. The best way to ensure healthy soil that offers all 17 nutrients is through the use of natural compost and manure added to the garden soil yearly, which replenish the missing nutrients and offer new nutrients to the plants. Fertilizers aren't the same thing as nutrients. Most fertilizers include only nitrogen, phosphorus and potassium and do not include the other trace macro and micronutrients that plants need. Many plant diseases are caused by missing macro or micronutrients. Blossom end rot on tomatoes, for instance, is thought to be caused by lack of calcium in the soil which makes plants susceptible to virus and bacteria. Like people, plants offered a 'junk food diet' missing critical nutritive elements suffer from malnutrition, which affects their growth. You could spend days or months learning about the four plant growth factors. The important thing to keep in mind is that sound gardening practices produce healthy plants. Regular crop rotation and addition of manure and compost create healthier plants by ensuring the soil isn't depleted. Providing heat mats for emerging seedlings encourages and stimulates growth. Ensuring adequate moisture in the garden during periods of drought helps plants flourish. Simple, basic gardening practices take into account all the proper elements for plant growth and provide overall support for happy, healthy plants.